When your mind is focused on a flip or a tuck that you have three seconds to complete before hitting the water, there is little time to reflect upon the team of 17 NCAA-bound swimmers counting on you to qualify for the national championships. Apparently reflection is not what freshman Connor Callahan needs to inspire an impressive performance. The lone diver representing the Cal men’s swimming and diving team, who has been exceeding expectations all season, continued to do so this week at the NCAA Zone E Diving NCAA Championships in Flagstaff, Arizona. 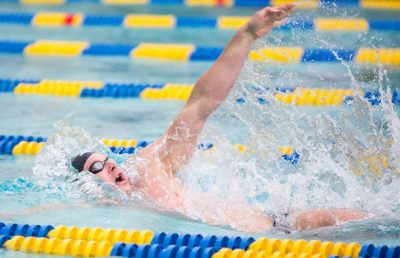 The zone championships held across the country constitute the final meets in which a diver can qualify for this spring’s NCAA Championships, and they offer a highly stressful environment. Only the top 12 in each event qualify, and point margins between the divers finishing from ninth to 13th place are unusually slim. Callahan, however, is not one to shy away from a challenge. Only a freshman, he became the second Bear diver to secure any berths at national championships since 2008. Seeking to qualify in at least one event between the 1-meter, 3-meter and platform dives, Callahan came out of the three-day meet with NCAA qualifications in all three, meaning that he secured a top-12 finish in each event. In the 1-meter, Callahan finished in seventh place with a total score of 632.5. His two strongest dives among his six tries for that event were his back 2 ½ somersault tuck and his forward 2 ½ somersault pike, and he placed fourth in both. He was even able to triumph over Stanford’s Cameron Thatcher, a fellow freshman who had consistently defeated Callahan by only a few points during multiple matchups this season. The 3-meter event takes place over six separate dives, and over that half-dozen Callahan built his total score to 662.95. For the 3-meter, Callahan excelled most notably at the forward 3 ½ somersault pike, for which he received a score of 58.9, seventh in the category. Callahan sealed his successful week with his best finish: a sixth place rank in the platform. His event average score of 6.19 points— one of the group’s best— contributed to his total of 315.60 points. The last Bear to qualify for NCAAs was junior Finn Scribbick in the platform when he was a freshman in 2015. Callahan’s strong finishes mark an upward trend for a diving program that, with more members in the coming years, has the potential to match the quality of the swimming program. For the near future, however, Callahan represents an opportunity to boost Cal’s score at the upcoming NCAA Swimming and Diving Championships in a way that past Cal divers have not been able. A previous version of this article misspelled Connor Callahan’s name.